PDM US Gelcopper® is the professionals choice because it is: SMART, DURABLE and GREEN. Find out more or simply… Try it, Love it! PDM US has representation in United States, Canada, Mexico and South America. Click here to find your local representative to best serve your needs. PDM US makes a significant effort to get out into the community it serves with it‘s tours and events. 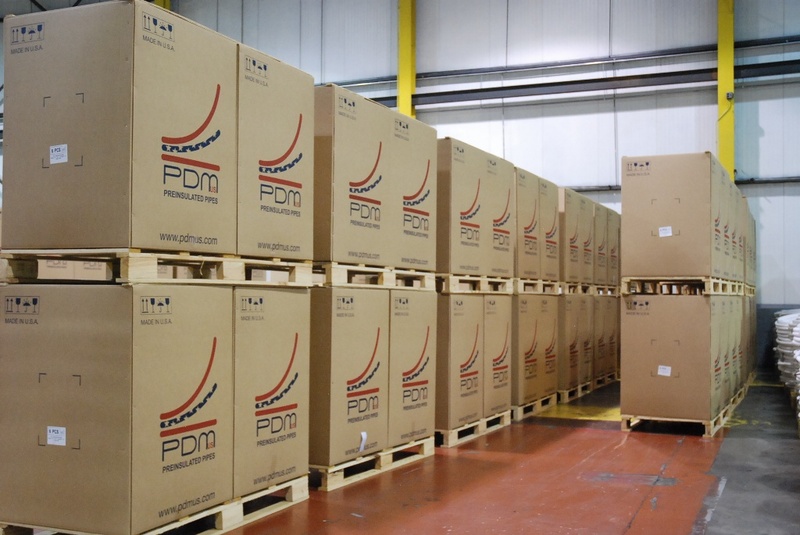 Find out if PDM US will be in your area soon. Individual preinsulated rolls that perfectly fits every air conditioning, such as ductless mini-splits, VRF, heat pumps and unitary systems. Available in 50 ft and 164 ft with 1/2”, 3/4” or 1” insulation thickness. All rolls are marked by the foot for proper line charging and maximum waste reduction. UL Certified: This product is UL723 CLASSIFIED R39562 (ASTM E84 25/50). Foot Marking: Insulation incrementally marked by every foot to ensure accurate initial unit charge and reduce copper waste. UV resistant: This product is UL PERFORMANCE VERIFIED for UV exposure and successfully tested internally for UV resistance for a minimum of 3 years. It provides the perfect size combination for both suction and liquid lines to fit every air conditioning, such as ductless mini-splits, VRF, heat pumps and unitary systems. Here‘s some of the highlights. 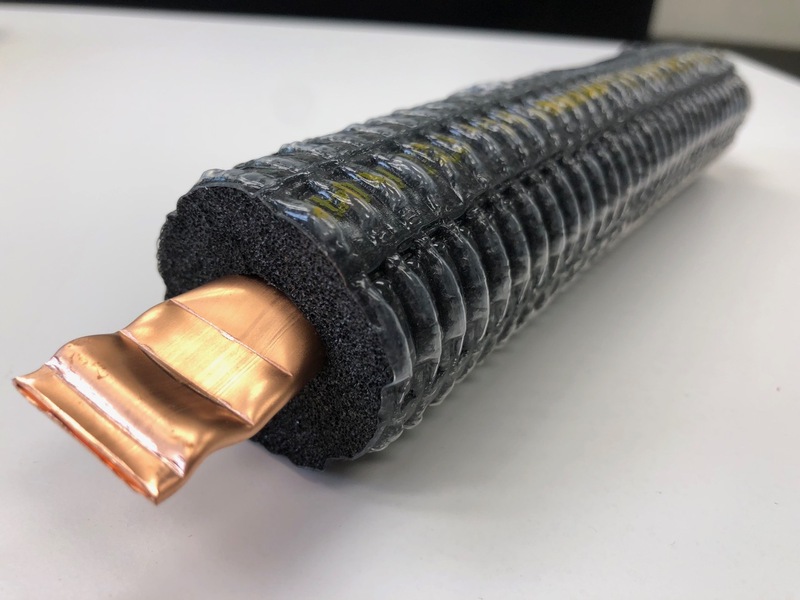 GelCopper™ insulated coils are machinery attached one to the other for faster and easier install. It provides the perfect size combination for both suction and liquid lines to fit every air conditioning, such as ductless mini-splits, VRF, heat pumps and unitary systems. An aluminum layer placed on top of GelCopper™ polyethylene insulation foam and protective skin makes product extremely durable and resistant. Its higher UV resistance makes it ideal for outdoor installations or even underground. 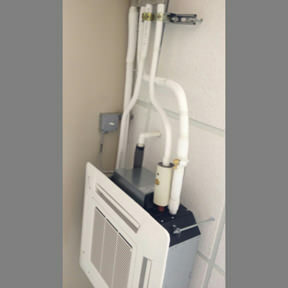 It perfectly fits every air conditioning application such as ductless mini-splits, VRF, heat pumps and unitary systems. Aluminum protective layer: Aluminum layer provides extremely high durability and protection. 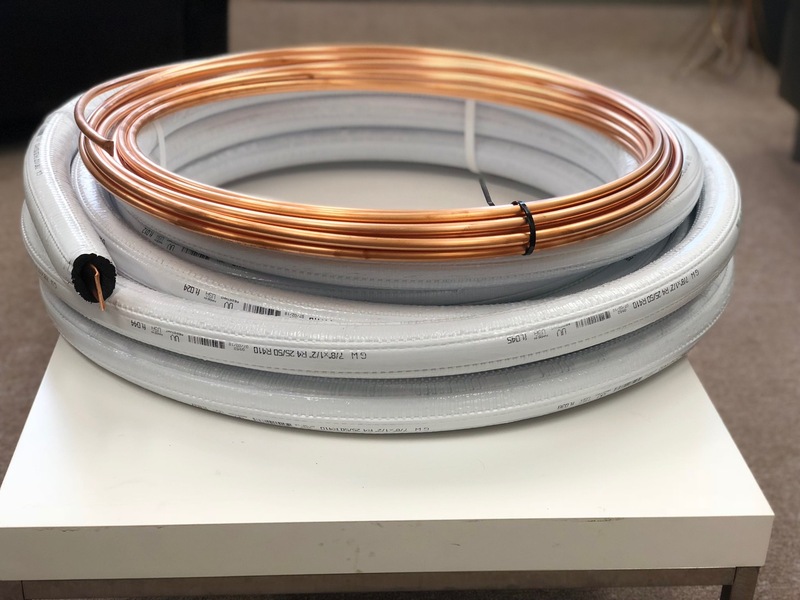 It provides the perfect lineset solution for unitary systems by combining a high-quality bare copper coil for the suction line along with a perfectly pre-insulated liquid line. Outer Jacket: Additional polyethylene jacket cover protects foam insulation from tearing during installation process. 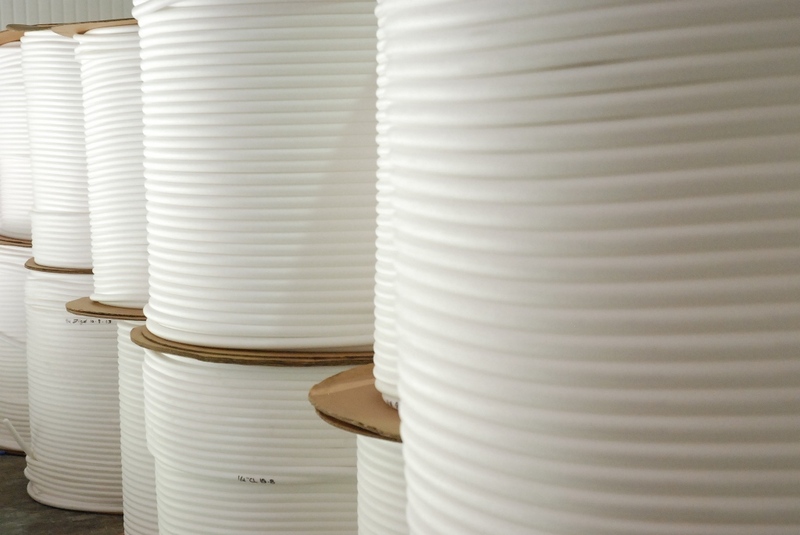 Extra Long spools of PDM premium insulation. 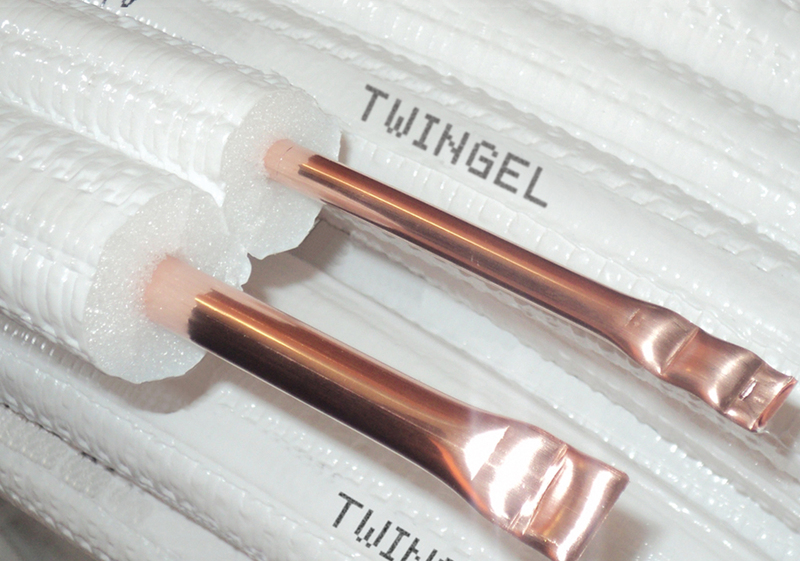 Ideal for new installations or to simply replace old or damaged insulation without having to change the copper coils. Good for Indoor or Outdoor. Available in different sizes and with 1/2” or 3/4” insulation thickness. 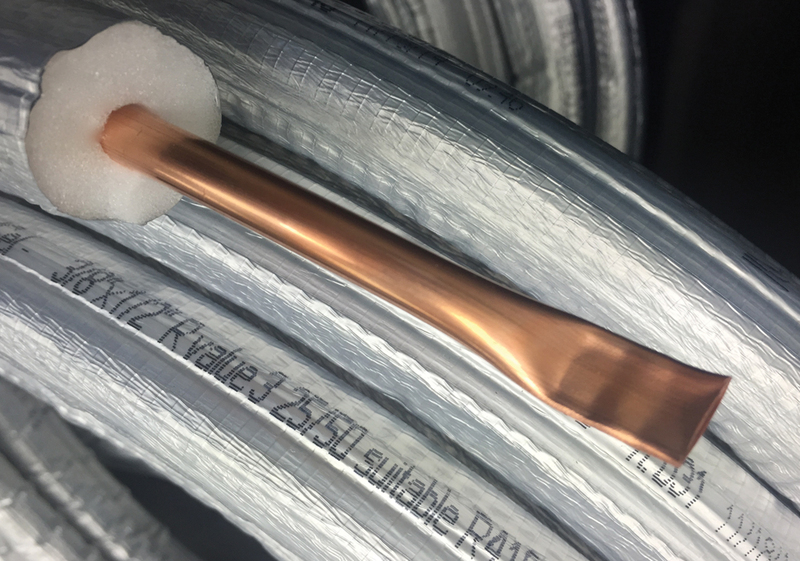 PDM latest creation, Infinitek, provides peace of mind when installing copper tubes in harsh environments such as areas with high ocean salinity or highly regulated facilities such as in the food industry or government projects where highest safety standard are often demanded. 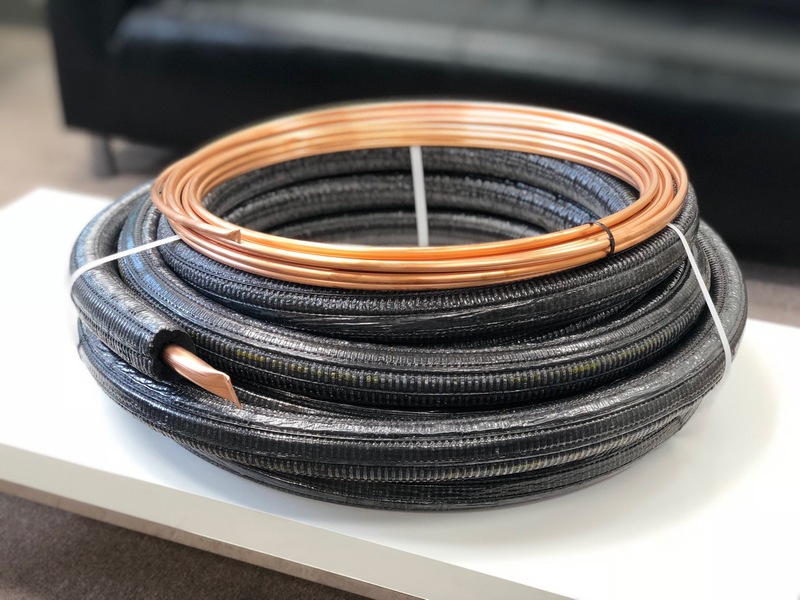 PDM Infinitek consists in a proprietary layer built on top of the copper tube and able to protect it virtually from any external agent, making the most durable coil available in the industry. All PDM copper products may now be ordered with this optional feature. PDM guarantees all its Infinitek powered products for 12 years from any defect. PDM US - "First In Pipes"
PDM US, counts on over 40 years experience in Europe in copper tubes manufacturing. In April 2013, we decided to relocate our World Headquarters and main production plant in Rock Hill, South Carolina, USA. 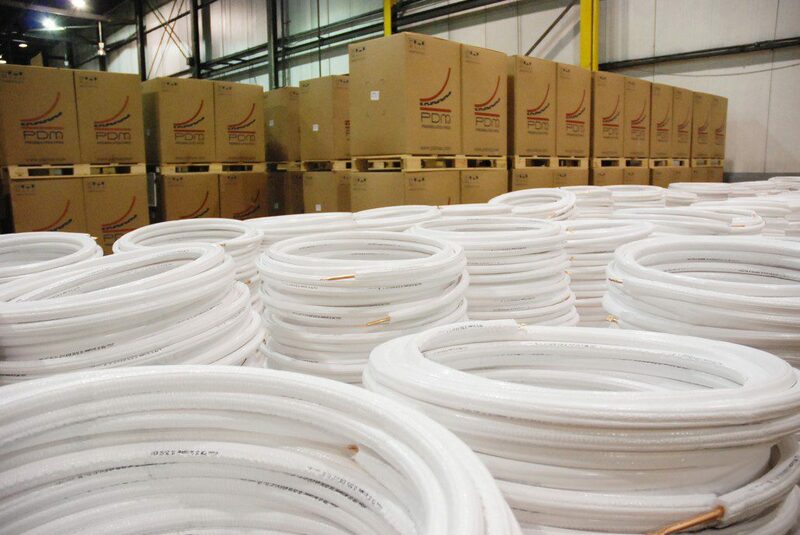 Since then, we pride ourselves on innovating, manufacturing and delivering the best preinsulated copper pipes in the US industry. 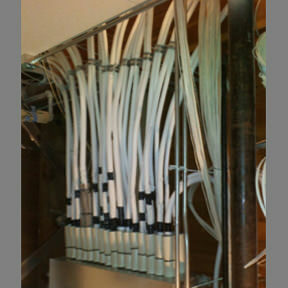 Our solutions continuously improve the HVAC piping industries with simple, durable and cost effective solutions. Our R&D keeps brain storming, testing and creating new products making sure we always keep leading and NEVER FOLLOW. Our proprietary products are all crafted to perfection and tested multiple times; moreover, our GelCopper™ product line is UL 723 CLASSIFIED for 25/50 and UL PERFORMANCE VERIFIED for UV exposure. It’s proven itself to work, to last and to satisfy your needs. Contact us and we’ll show you how it’s done. We pride ourselves on our service by keeping our customers the number one priority. Choosing PDM US means also creating a delightful supplier-customer experience. Our plant is always in production – 24hrs a day, 7 days a week, 365 days a year. We never stop, constantly timing in advance the right production cycles, making sure to always have enough products to quickly and efficiently fulfill your orders. Our polyethylene internal foam and protective outer jacket make our solution extremely tough and very difficult to tear or break apart. Our insulation is the most resistant and long lasting in the market. Other competitors’ insulation breaks by simply tearing it by hands or falls apart over time. Most of the products from our competitors are made in Asia or Europe. Ours instead, In compliance with the Buy American Act, are 100% made in the USA using exclusively American ingredients and therefore guaranteeing a high-quality product, consistent availability and efficient logistic. We strongly support the buy American act. 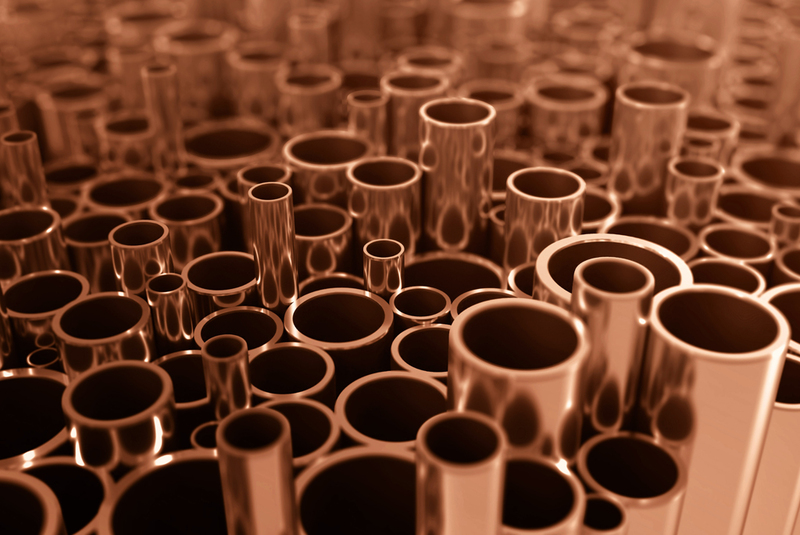 We only use high-quality ASTM-B280 / 700 PSI R410 copper exclusively from top US mills. Several competitors of ours simply insert the copper tube into the insulation leaving a wide gap that could lead to condensation. 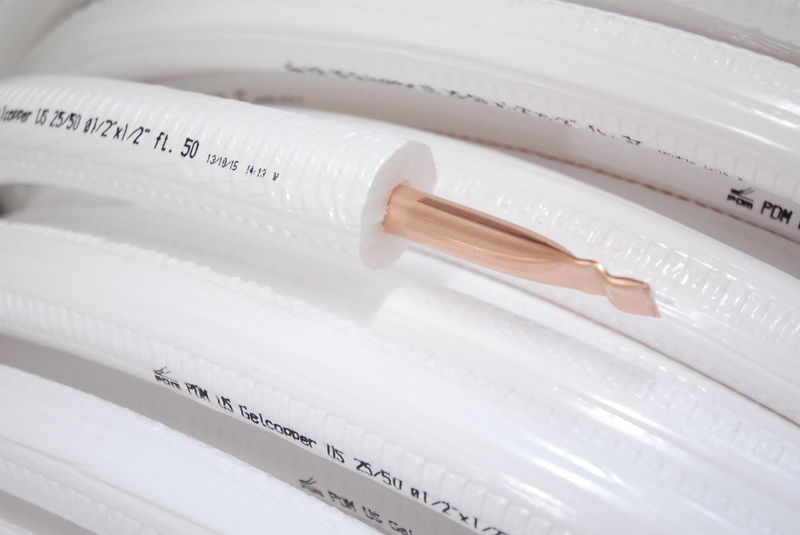 Our pre-insulation process instead is performed by MACHINERY driven technology where the polyethylene foam is built on the copper tube and then coated by an additional protective outer jacket. 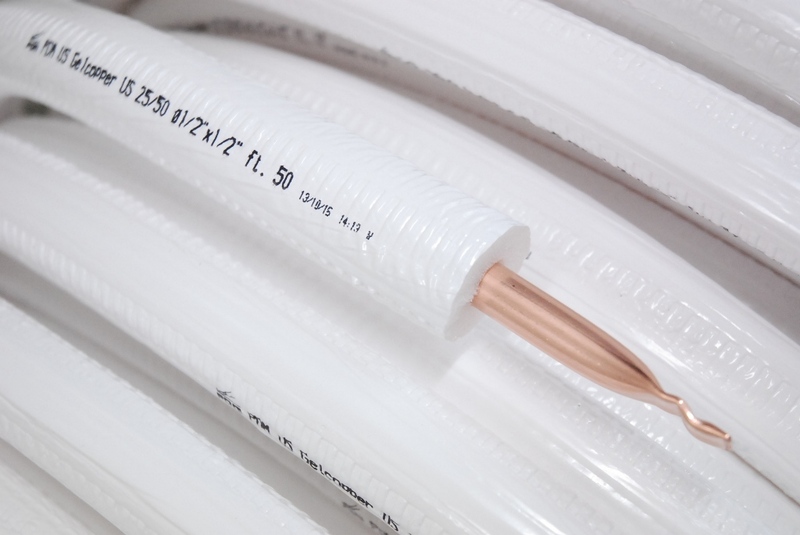 This process ensures the insulation to be extremely tight around the copper tube preventing any risk of condensation. Our insulation has higher R-values when compared to similar thickness of traditional black rubber or to the ones of most of OUR competitors. 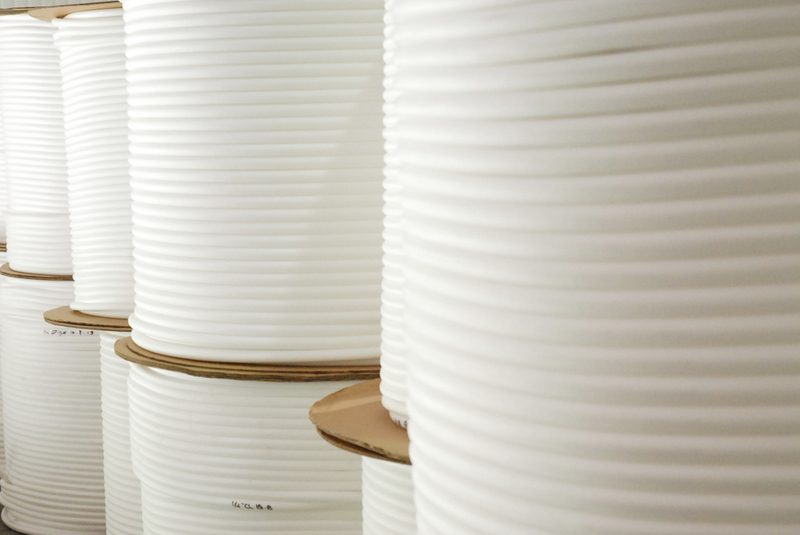 Our products are the first ever to be UL 723 CLASSIFIED – ASTM E84 25/50 for fire and smoke. Our products are all Plenum Rated. Our GelCopper™ product line is UL PERFORMANCE VERIFIED for UV exposure (visit:https://verify.ul.com). All other PDM products were successfully tested internally for UV resistance against any major degradation, discoloration or deterioration for a minimum of 3 years. 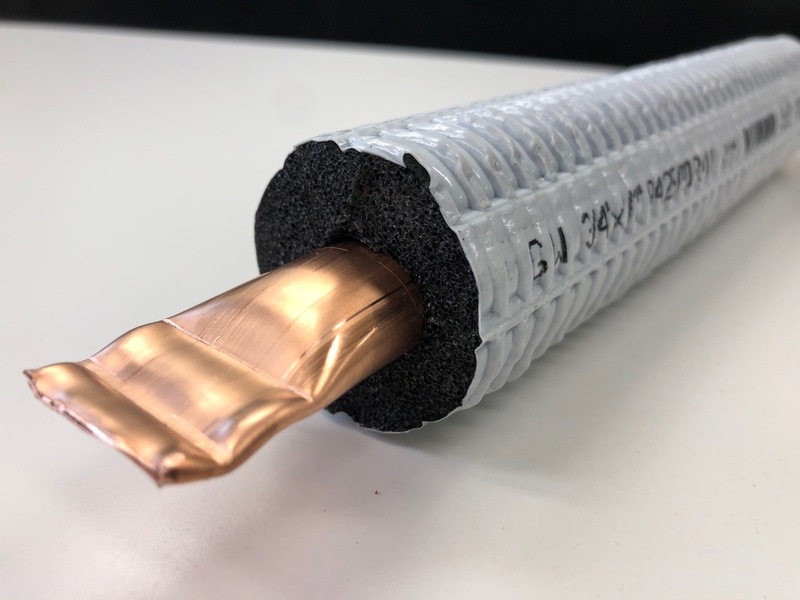 The last phase of our insulating process ends by foot marking each of our rolls so contractors can count accurate initial unit charge, reduce copper waste and perform a professional installation. Traditional black rubber does not have this feature. The standard color of our product is a beautiful shiny white, but eventually it can be painted to match the surrounding. We are the true innovators of copper pipes insulation in the United States. We continuously evolve and set the trend for quality in our industry. We lead this market by improving our current products and constantly launching new solutions. Today we are one of the fastest growing companies in the HVAC industry and in the United States economy. PDM US has the advantage of a global economy. Due to their vision, they have set themselves up to be able to provide great products and service to many parts of the globe. PDM US currently has representatives in the US, Canada, Mexico and South America – and more countries to come. Click on the map to find representatives in your area or click one of the buttons to register with us or to contact us directly. If you‘re a representative agency and want us in your market, please contact us directly. You probably have some questions, right? Well, this section will hopefully help answer any of those initial questions you may have. We put down the questions and answers that we get most of the time. If you don‘t see a question or answer you have listed here, please contact us. We‘re here to help. Why should I use GelcopperUS over a standard product? GelcopperUS was the first polyethylene-insulated product in the market and the first to feature a protective film on the insulation. This film acts as a protection from tearing during the installation saving you time and money. 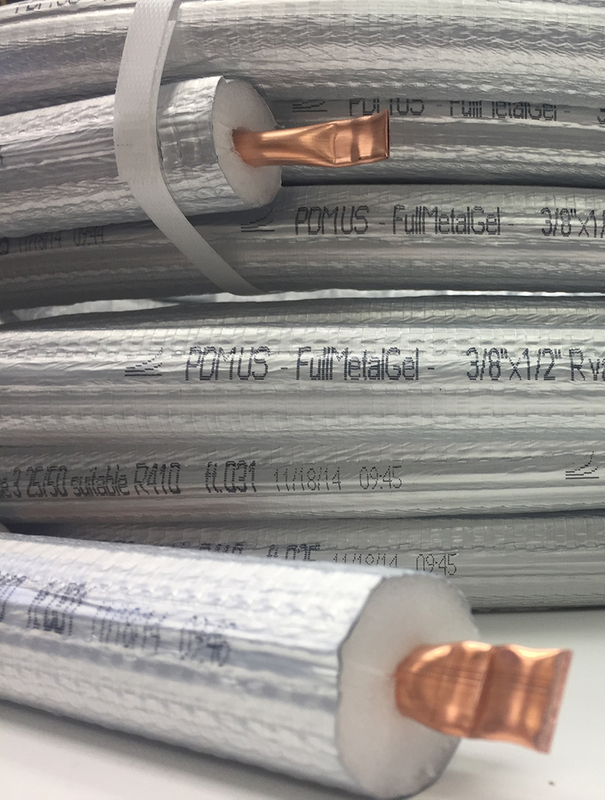 GelcopperUS was the first product in the market offered with incremental foot marking which helps during the process of charging the unit with refrigerant guaranteeing a first accurate charge. PDMus pioneered the usage of longer rolls introducing in the market the 164ft rolls. A longer roll means to minimize the possibility of scraps (saving money) and allowing you to have continuous runs on VRF installations where 70ft or 80ft runs are common. The benefits of a continuous run are the time saved to not have to join together two rolls (common method) and the possible hazard that a leaking joint creates. This is why GelcopperUS is the professionals’ choice! Is GelcopperUS available in any size and length? GelcopperUS is currently available in sizes 1/4 – 3/8 – 1/2 – 5/8 – 3/4 – 7/8 and in lengths 50ft and 164ft. Is GelcopperUS copper conformed to domestic code? 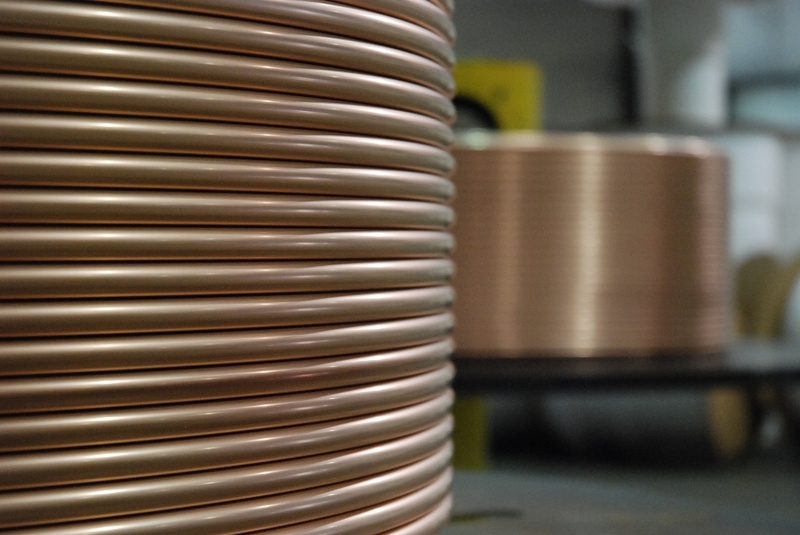 Yes, PDMus only uses high quality domestic copper rated per ASTM B280. Is GelcopperUS insulation fire and smoke rated? Yes, PDMus sent samples of GelcopperUS to UL laboratory in order to be tested according to UL723 – ASTM E84. 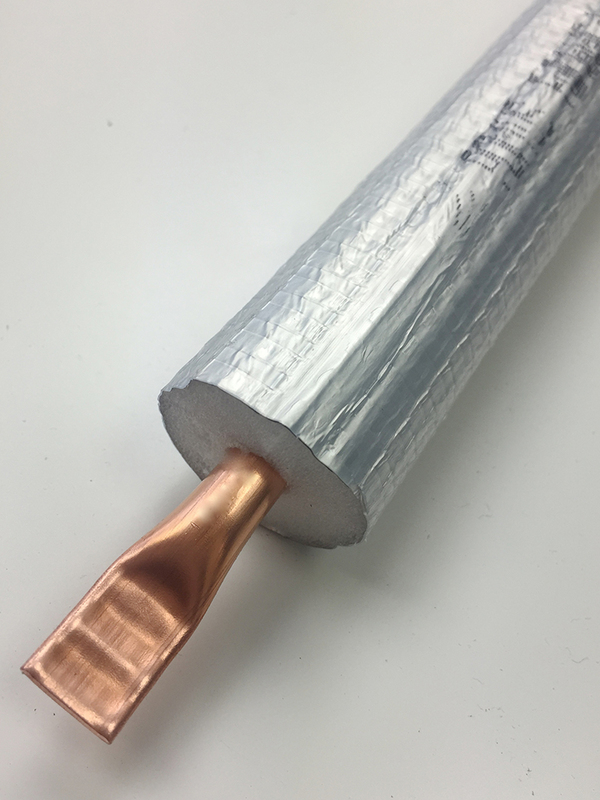 GelcopperUS passed the test according to UL 723 – ASTM E84 for 1/2″ and 3/4″ insulation thickness (test results available upon request). Is GelcopperUS insulation UV rated? GelcopperUS insulation is UV resistant. The external film on our insulation is engineered to help lasting longer under the direct exposure to UV rays. However, we always recommend to protect your GelcopperUS by installing it under duct or taping it or paint it with a UV protective paint. What is GelcopperUS R value? 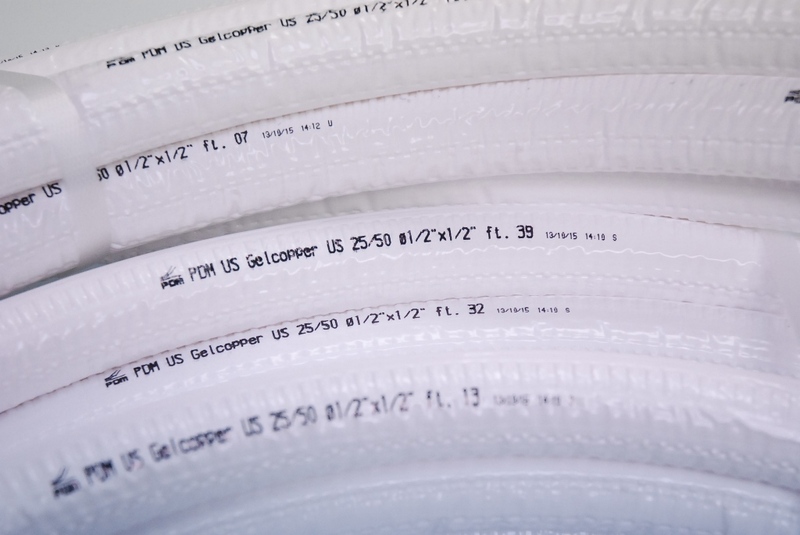 The R value in PDM US insulation varies between 4 and 9 depending on insulation thickness and diameter. Our R value calculation table is available upon request. I’m a contractor, can I buy directly from PDMus? We highly value the cooperation and relationships we have built in these years with our distributors around the globe. A strong distributors network means a higher level of support for you. We thank you for your interest in using PDMus products and we encourage you to send us your information and we will redirect you to one of our distributors. I’m a distributor but I want to try GelcopperUS before committing to it, can I buy few rolls? 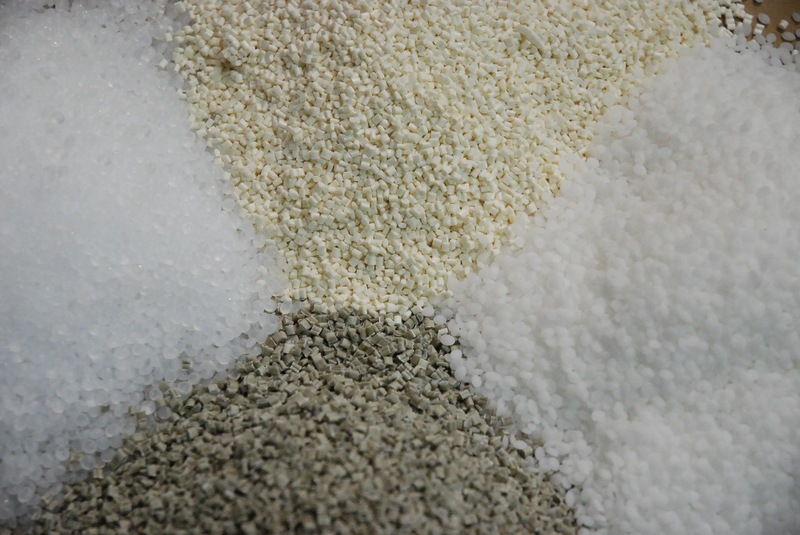 Thank you for your interest in PDMus products, we encourage you to send us a formal request with your information and one of our sales representative will get in contact with you as soon as possible. We‘re conveniently located just east of 77 in Rock Hill. Our facility boasts a large amount of square footage to accommodate our current operations, volume and inventory. It also has ample room for a lot of expansion. This allows us to handle small to very large orders with ease. Please contact us for more information. We‘ll be waiting. Contact us today to learn more about our products and how we can serve you today.